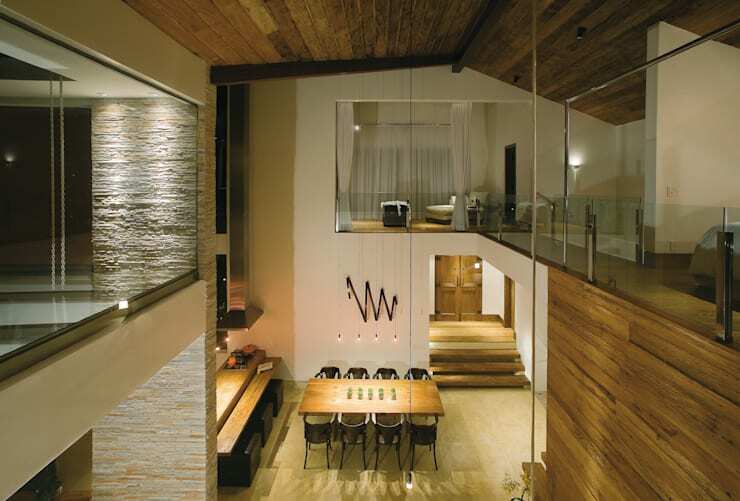 From the renowned firm, Isabela Canaan Architects and Associates, comes a house to excite all. Found in the tranquil countryside of Brazil, the architects have designed a home for loft living that seems to extend right into the breathtaking hillside environment. The most prominent feature of this house is its large windows and almost entire openness to the natural surroundings. The results are inspiring, as the natural light touches each corner of the open-plan home on all its levels. 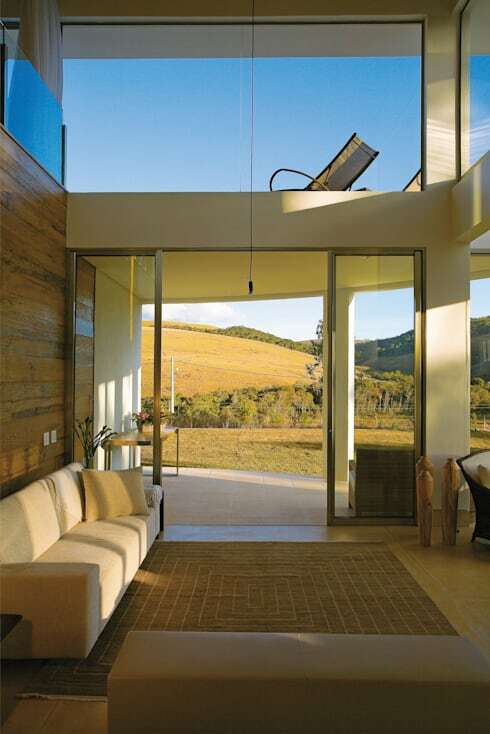 In addition, the panoramic views of the enchanting country scenery can be appreciated from any position in the home. This type of grand design suited to a specific environment is not new to the firm, as can be appreciated in another project situated in the suburbs. But let's take a tour of this magnificent country home first. Our first meeting with this house is a full frontal view that is all but disappointing. 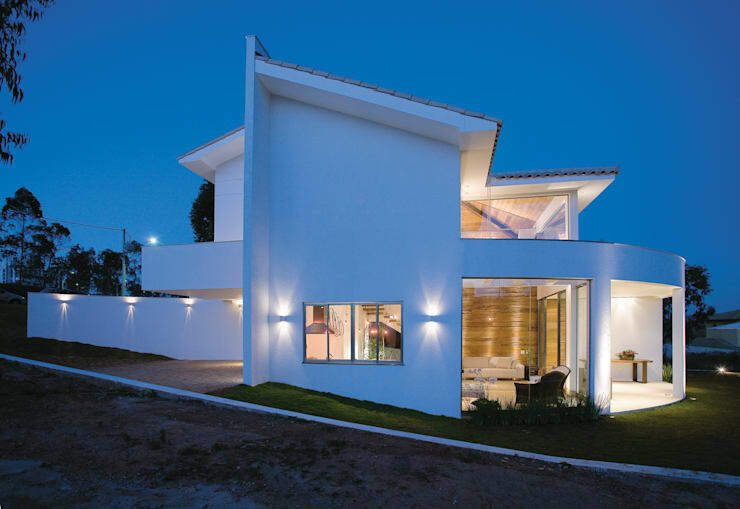 The striking white exterior is divided into several components that seem to hold their own. This distinguishes several levels and individual spaces already visible without moving inside the home itself. 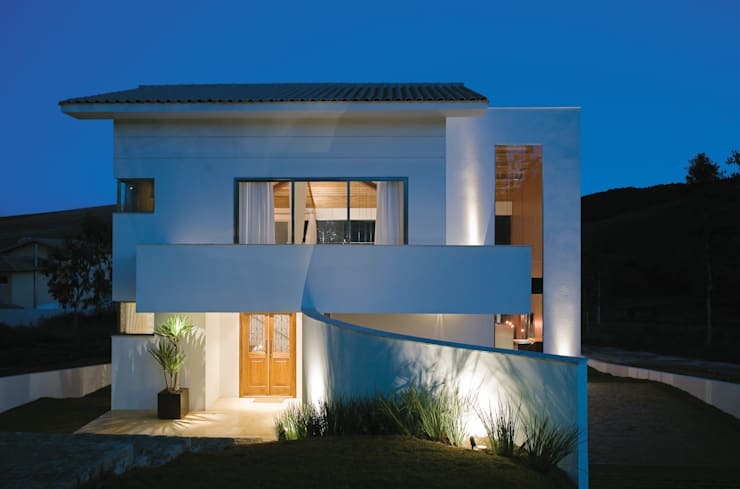 The exterior lighting used here also gracefully colours the white canvas in the twilight. In this front façade of this house we are already introduced to the prevalent use of glass in the home's design. It is evident that the windows play an extremely important role in the function and form of the design, and that it is just as important for the house's general aesthetic. A side view of the house is just as impressive. Here we can see the strong geometry that divides the structure into interesting shapes and segments, but also creates a coherent whole. This design allows for being able to see the house from many different angles and possible seeing something different from each of these. The exterior lighting seen from this vantage point is strategically and reasonably placed. 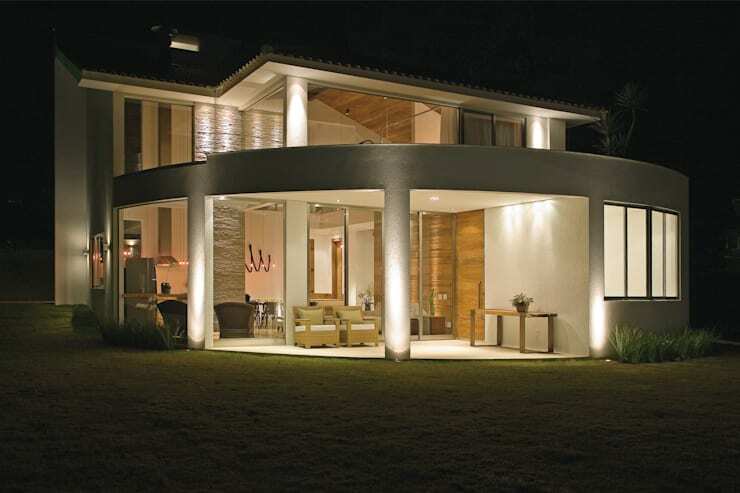 Lights both mounted on exterior walls, as well as ground lighting is used throughout. The wall-mounted lighting is highly functional, whilst the grounded lights illuminate the structure in a grand manner as to draw attention to the most prominent features of the façade. Moving around to the back of the house, we can see a semi-circle porch radiating out from the main structure. This allows for a panoramic view from this point, making it the ideal entertainment area. This large, open area does an excellent job of integrating the home right into the natural environment where it is situated. On top of this radial ground-floor component is the neatly squared top level of the home. This smaller top level structure allows for a large balcony space that makes use of the rooftop of the radial base. The panoramic view can thus be enjoyed from the porch as well as—and even more so—form the first level balcony. On the inside of the house we find an opulent lounge area endowed with a sense of grandeur. This is effected by astounding, large windows allowing an uninterrupted view of the luscious countryside. The bold, white supporting beams and the grid above the seating area is reminiscent of an outdoor veranda, adding to the indoor-outdoor integration. The furnishings of this space is well-suited to the structural design. We can see the back of an elegant fireplace extending from a stone wall inset which reflects the rich colours of the natural surroundings. The minimal furniture ensures that the scenery remains the focal point. The entire interior space of this house is completely open-plan across both levels. The effect is that of overwhelming grandeur. The space effortlessly integrates the different areas or rooms of the house into a coherent whole that can be equally appreciated and enjoyed from any spot in the home. From this vantage point we can see the entrance of the house with a convenient and lovely wooden entryway space. After this one would move into the dining area stylishly furnished with minimal elements and impressively long pendant lights, and to the left of the composition we can see the counter of the kitchen area. On the top floor of this side of the space, we can see a wooden walkway with glass banisters which expands the first-floor space. The room seen at the farthest end of the house can be closed off by white curtains to allow for privacy. Turning around 180 degrees, we can see the other side of the interior of the house. On the floor we can see the previously explored lounge area to the right of the picture. To the centre of the space is an extended living room space where the seating allows for a direct view to the rolling hills on the outside. The entire space is punctuated by the same impressive pendant lights first seen in the dining room area. On the loft level we can see the master bedroom to the right. The glass banisters and the direct opposition to an expansive glass panel across the house allows for endless appreciation of the scenery right from bed. The bedroom also opens up on the radial balcony to enjoy the environment even further. A closer look at the living room area as our last stop in this amazing house is a pleasant conclusion. The warm, open space is flooded with light from the large windows an lavish use of glass. 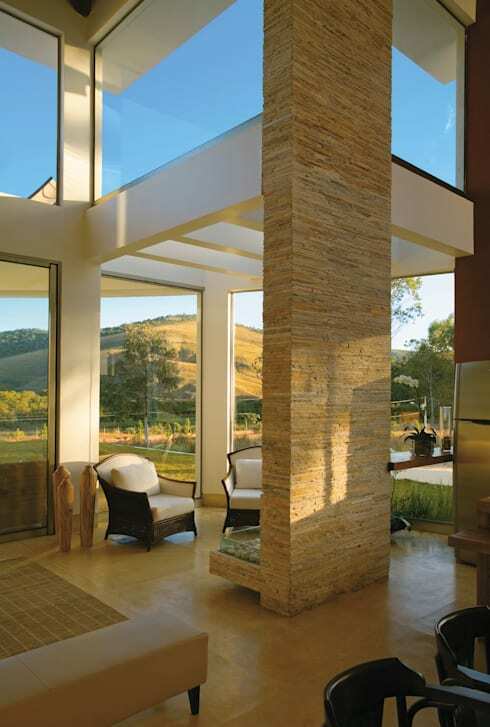 The furnishings are simple and well suited to the overall natural atmosphere of the interior and exterior. Large, sliding glass doors open up onto another, more modest patio area. This certainly seems like the ideal spot for spending hours of solitude in communion with nature or with a good book at hand. Tranquillity perfected. Were you surprised by the home's interior? Did you love those views? Let us know!